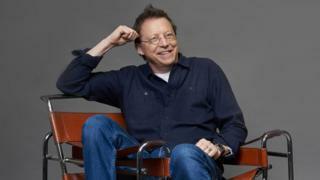 DJ Simon Mayo has helped launch a new classical music radio station, two months on from leaving BBC Radio 2. Mayo, 60, is hosting a mid-morning show on digital station Scala Radio, which broadcast for the first time on Monday. Mayo opened his first show by quoting the late Alan Freeman and dedicating a track to "old friend" Jo Whiley. Whiley co-hosted Radio 2's drivetime slot with Mayo for the last seven months of his eight-year tenure, prompting a backlash from listeners. Mayo later admitted it had been "an awkward, stressful few months", saying he and Whiley had "worked very hard to make [the] show as good as it could be." "Not nervous at all," the broadcaster tweeted shortly before going on air on Monday, having earlier confessed he had had trouble sleeping. "This sleep thing doesn't really work when you've got a new radio station to launch," he wrote on Twitter. Image caption Jo Whiley agreed with one tweet describing Mayo as "a class act"
Features on his show include a "Mayo clinic" for "everyday queries" and a trivia quiz called Op Master. Its title is strangely reminiscent of Pop Master, a regular feature on Ken Bruce's mid-morning Radio 2 programme. Mayo will continue to co-host his Radio 5 Live film show with Mark Kermode, who has also been given his own show on Scala. Listeners have tweeted appreciatively about Mayo's debut on the station, which is owned by Bauer Media. "So glad to have you back," tweeted one, while another said it was "lovely to hear [his] voice on the radio again". Some also praised Mayo's "shout-out" to Whiley, with one listener saying it showed he was "a class act". "That he is," Whiley wrote in a response to Jack Blackburn's tweet.